Phoenix, AZ (November 29, 2018) — Arizona Roots Music & Arts Festival will take place at the Riverwalk at Rawhide Western Town & Event Center on February 9 and 10, 2019. The festival will be brought to you by the same team that brings you the California Roots Music & Arts Festival in Monterey, CA. Over its ten year history, Cali Roots has become synonymous with top-notch performances and unforgettable festival experiences. The brand’s venture to Chandler, AZ to plant new seeds and spread good vibes has seen an amazing response from fans and media outlets alike. 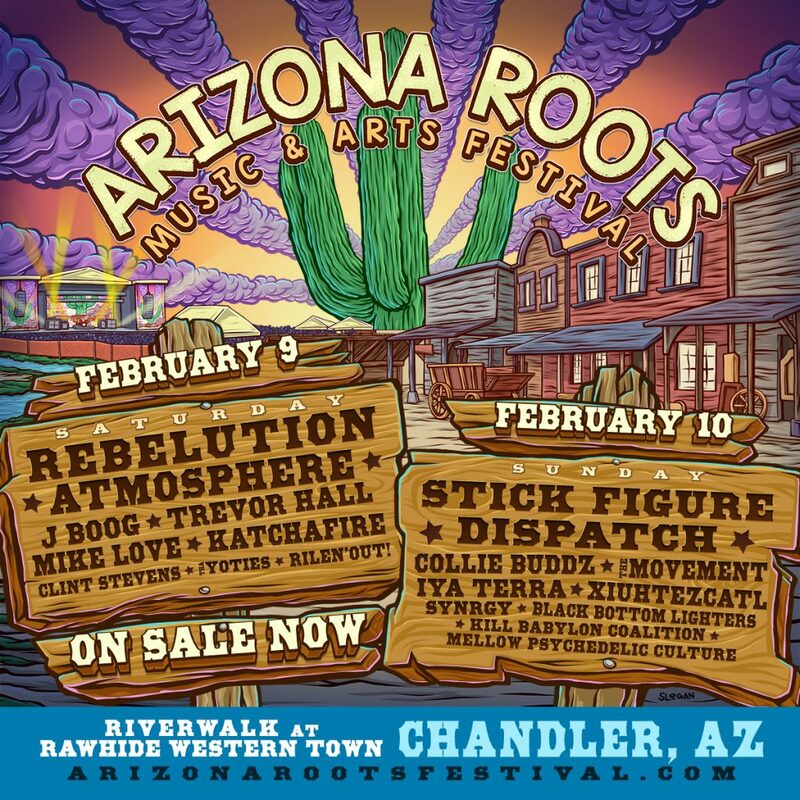 Arizona Roots is thrilled to announce its single day lineup, which features headliner, Rebelution, along with Atmosphere, J Boog, Trevor Hall, Mike Love Katchafire Clint Stevens Tha Yoties and Rilen’ Out!on Saturday, February 9. Headliner, Stick Figure, with Dispatch, Collie Buddz, The Movement, Iya Terra, Xiuhtezcatl Synrgy Black Bottom Lighters Kill Babylon Coalition and Mellow Psychedelic Culture will close things out on Sunday, February 10. Tickets for Arizona Roots Music & Arts Festival are on sale now at www,arizonarootsfestival.com. Weekend General Admission tickets, along with limited Saguaro Weekend Passes (VIP Pass), Camelback Weekend Passes (Platinum VIP Pass) and Single Day Passes are now available. For full details and all ticket options, visit www.arizonarootsfestival.com. Arizona Roots Music & Arts Festival is an All Ages event. Stay connected on Facebook at www.facebook.com/azrootsfest, on Twitter at www.twitter.com/azrootsfest and Instagram at www.instagram.com/azrootsfest.